After a long preparation time the hosting - brand "EUserv"was founded in January 2005. 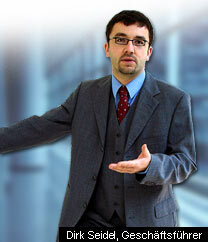 Euserv operates as a web host of dedicated root servers, webspace and domain budget-conscious users. Meanwhile, EUserv also offers dedicated server and high availability services for professionals. The company is one of three business areas of the ISPpro Internet KG from the technology region of Jena in Thuringia. The successful and experienced Internet Service Provider is trusted since 1998 from tens of thousands customers due to its powerful and innovative service offerings. The first extension of the product line took place in April 2005 with the launch of email-services for a more sophisticated communication than in the pure domain registrations. In August 2005, the capacities of the data centers were expanded and gave EUserv the possibility to become one of the first providers in Germany that offers flat rates for traffic for dedicated server. There were the "unmetered"("uncounted" =) tariffs introduced by dedicated root servers. Data transfer volume was no longer calculated in the tariffs. "WEB favorable. HOSTING good." Euserv offers their customers, as an Internet service provider, extremely good value products through an extensive range of powerful and well-designed web hosting solutions. In this case, the provider builds on years of experience of its parent company. Two modern data centers in and around Jena, Thuringia are the foundation for delivering performance. Latest network and server technology as well as links to the best high-speed fiber optic backbones enable around-the-clock super-fast access to customer sites. The best conditions for the ever-growing demands on EUserv in the future are contracts with solid partners in the areas of domain registry, connectivity and hardware. Specialists working on the organizational and technical implementation of internet services. Professionalism and expert advice award our team.